Millenniums ago Bible prophecy foretold a powerful United Europe for our day! The world little realizes the awesome outcome of the present drive to unite Europe into one economic, political and religious bloc! Yet, you can know the long-prophesied outcome, and recognize ahead of time the effect it will have on you. TODAY, I saw prophecy being fulfilled here at The Hague. Multitudes of demonstrators marched through the, streets chanting unity slogans. I was an eyewitness to what God had prophesied thousands of years ago. About forty different "Unite Europe!" groups or associations filled the air with their demands. Europeans are becoming impatient! They aren't willing to turn gray-haired before they see their vision of "One Europe" come true. These sentiments were best echoed by one group which chanted, "United Europe — now!" Will the long-dreamed-of "United States of Europe" become a reality in our time? Will a strong, United Europe be a good thing? Will it help bring greater peace, prosperity and stability to Europe and to the world — as its architects envision? You need to know the prophetic answers to these crucial questions. The Bible reveals the startling answers to these vital questions. You need to really understand the full significance of where today's drive to UNITE EUROPE, and turn this long-divided continent into a strong Superpower, is leading. Does it seem a thing incredible to you that the very God who created and sustains the seemingly boundless universe is able to foretell the destiny of today's nations? We can understand the real meaning behind today's news, because we understand God's Word. And in His Word He has a lot to say about the destiny of today's major nations. Yet, so many cut themselves out from this vital revelator source of knowledge — through prejudice and ignorance! Even though the Bible is still the world's best-seller — and is owned by more people than any other book — very few of those who profess to believe in it really believe what it says. As an example, how few Christians even know that the Bible gives many specific, detailed prophecies regarding today's modern nations — prophecies which at this very moment are being fulfilled. Do you realize that approximately one third of your Bible is prophecy? And perhaps as much as ninety percent of that prophecy will have its fulfillment in the very age in which you and I are living! Let's put it another way: Can you believe that the Great One who created the vast universe with all its order and complexity would NOT reveal to man the major cataclysmic events which are soon to befall mankind? Ridiculous. God has always sent His servants to every generation to reveal beforehand the world-shattering events which He was about to bring to pass — and our generation is no exception. God sent Noah to warn the antediluvians that a worldwide flood would soon occur. Later, in the time of Abraham, He sent Lot to warn the perverts of Sodom and Gomorrah — before He rained down fiery destruction from heaven. Repeatedly throughout the Old Testament you will find that God sent His servants the prophets to warn cities, nations and empires of calamities which were about to crush them. But they were WARNED nonetheless! Then God sent Jesus Christ to warn the nation of Judah and the city of Jerusalem that the cruel Roman legions would soon level their fair city to the ground, slaughter many of their peoples, and scatter the remnant to the ends of the earth (see Luke 19:41-44). But, did they heed? History shows they didn't. Their awful fate has been indelibly stamped on mankind's record book by Josephus and others. It is in the secular record — if you wish to read it. God's servant Daniel understood that it is God who reveal the secrets regarding the future: "But there is a God in heaven that revealeth secrets, and maketh known to the king Nebuchadnezzar what shall be in the latter day" (Dan. 2:28). Daniel then proceeded to reveal to King Nebuchadnezzar what God had shown him — that there would be four great world-ruling kingdoms on the earth from that time until the coming of the Messiah — Babylon, Medo-Persia, Greece, Rome. Notice how the Apostle Peter explained the importance of prophecy — and of the necessity for allowing God to interpret it: "We have also a more SURE WORD OF PROPHECY; where-unto ye do well that ye take heed, as unto a light that shineth in a dark place, until the day dawn, and the day star arise in your hearts" (II Peter 1:19). This "sure word of prophecy" — this "fresh confirmation of the Prophetic Word" as Moffatt translates the same Greek phrase — gives us the all-important "light" which reveals the future. "Knowing this first, that no prophecy of the scripture is of any private interpretation. For the prophecy came not in old time by the will of man: but holy men of God spake as they were moved by the Holy Spirit" (II Peter 1:20, 21). We can never rightly understand the prophecies of the Bible unless and until we learn to let God and God alone interpret His own prophecies. Why is it that the average Christian — or even the average clergyman — makes little or no effort to study and understand God's prophecies? Did God put these prophecies (one third of the whole Bible) in His Word merely to take up space? Or, did He want us to understand them? It is of course true that God did not necessarily intend all of the prophecies to be understood at the time they were written. Daniel explained this very clearly: "And I heard, but I understood not: then said I, O my Lord, what shall be the end of these things? And he said, Go thy way, Daniel: for the words are closed up [to human understanding] and sealed till the time of the end…I None of the wicked shall understand; but the wise shall understand" (Dan. God intended that we understand these things in the "time of the end" — in the end time of man's allotted 6000-year period of misrule. And that's today's world! W e can understand Bible prophecies today — if we are willing! How is it that we can give you the answers — and reveal the outcome of today's fast-moving events — when most news reporters and commentators are unable to do so? We know that there is a Creator God in Heaven, and we strive daily to live by His Commandments. As a direct result, we are given a good understanding (Psalm 111:10). We realize that only through His Word — the Bible, His Divine Revelation to man — is the outcome of present-day world conditions revealed. God's Word guides us into all truth and shows us the "things to come" (John 16:13). God is using His Work — this Work — to inform the world of the cataclysmic events of the next few years before they occur, so that all humanity will be forced to recognize that the Eternal God of the Bible is indeed the only God (Ezek. 6:10). We — this Work — are preaching and publishing the Gospel of the Kingdom of God — the Good News of TOMORROW'S WORLD — for a witness to all nations (Matt. 24:14; Mark 13:10). We have been "drafted" as it were, commissioned, to speak out (Isa. 58:1) about today's world conditions — to warn you ahead of time how they are going to affect you and yours (Ezek. 3:17-27 and 33:1-16). Is God silent about the major nations and power blocs now extant on earth? Is it reasonable that He would give detailed prophecies regarding many smaller nations like Egypt, Syria, Greece, Libya, Ethiopia, and not even so much as mention important nations like the U.S., Britain, Russia, Germany? The simple fact is that God has not failed to mention these nations. All of the mare indeed mentioned in God's prophecies for our generation. But there's one key: these nations are mentioned under their ancient, ancestral, Biblical names. Most professing Christians, and even c1ergy men, haven't spent much time studying into the Biblical identities (the ancestries) of the various peoples on earth. Yet they have spent a great deal of time studying subjects of much less importance! They do not think it important to study the prophecies of God's Word! But it is mighty important in God's eyes — otherwise He would not have included so many prophecies in His Word regarding the various nations. Where — Lost Tribes of Israel? Christ commanded His apostles to "go rather to the lost sheep of the house of Israel. And as ye go, preach, saying, The kingdom of heaven is at hand" (Matt. 10:6, 7). The sane applies to God's true ministers today. They, also, are to go preach the gospel to the "lost sheep of the house of Israel." But how many Christian-professing ministers even profess to know where the lost ten tribes of Israel are? The Jews freely acknowledge in their writings that the "lost ten tribes of Israel" are still lost. Many Christian clergymen also believe the "lost ten tribes" are still lost. But why are so few willing to seek out the lost tribes of Israel? You can know the true identities of such nations as the Anglo-Saxon-Celtic-descended peoples — if you are interested! If you want the facts on this thrilling and most important subject — proving that the United States, the British Commonwealth and some of the countries of Northwest Europe are indeed descendants of the lost tribes of Israel — then he sure and write immediately for our free, fully illustrated book entitled United States and British Commonwealth in Prophecy. It will enlighten you on this most important subject. It will show you where the "lost sheep of the house of Israel" are today! This can now he proven both from the Bible and secular history. It is vitally important to know the Biblical identity of nations like the U.S. and Britain. Prophecy reveals that our peoples will — unless we repent — have a head-on economic and military confrontation with a powerful, nuclear-armed United Europe. And it doesn't look as though we are about to repent. Now let me explain more fully why the recent Summit Meeting of the Six members of the Common Market who met at The Hague was so important! You should now begin to grasp why we reporters for TOMORROW'S WORLD can and do understand the real significance behind the recent EEC Meetings at The Hague. We know who the peoples of America and Britain are — and where they are mentioned in Bible prophecy. We also know the identities of such nations as Germany, France, Italy, Russia. And we also understand the facts of past history — we can see the ultimate outcome of what has already, happened on the Continent of Europe. For nearly thirty years, we have been saying that a United States of Europe would rise up. The creation of this U.S. of Europe now appears imminent! This pivotal event will occur just before the close of this present age — immediately prior to the glorious second coming of Jesus Christ to this war-torn earth, when at last a "strong hand from somewhere" will put an end to war, poverty, pollution, famine and disease. But before the formation of the political machinery of this soon-coming United States of Europe, there would be an economic union of the nations of Europe. This economic union would make possible the laying of the POLITICAL foundation for a powerful U.S. of Europe. Will Britain ever be admitted into the Common Market? And, if she does enter the European Economic Community (EEC), will she remain in this union? The answer to this first question is not clearly revealed in Bible prophecy. The prophetic indication are that it is more likely that Britain will never be allowed to join the EEC at all. But one thing is certain. Bible prophecy clearly shows that Britain will not be one of the TEN NATIONS comprising the final United States of Europe. Why is this so? How do we know? Before answering these questions, we need to examine the purpose for which the Common Market was originally created by its European architects. True, the architects of the Rome Treaty had economic unity in mind, but POLITICAL unity was to be the second and final stage in the development of the Common Market community of nations. Notice this significant statement: "From the beginning, the final aim of Europeans [referring to the members of the Common Market] has been the creation of a European FEDERATION. From 1950 onwards, the Six members of the existing economic Communities entered into the process of economic integration, the end of which was to be A POLITICAL COMMUNITY..." Uniting Europe, a Europe House Publication, published by The Campaign for Europe [emphasis ours]). This same book continues: "The 'Relaunching' of European unity has today become a real possibility.... Most important of all, the age-old suspicions between the people themselves — and especially among the younger generations — are being gradually replaced by a new sense of European identity.... But there is a long way to go towards that 'ever closer union of the peoples of Europe' sought in the preamble to the Rome Treaty... to point the way forward in the POLITICAL field is less easy than in the ECONOMIC field.... For this vary reason, it is all the more essential to spell out the aims at the beginning, setting a 10-12 year timetable wherein the basic framework of a politically integrated Europe can be achieved." Not long ago Franz Josef Strauss (former Finance Minister in the Kiesinger government) told me the same thing. When I asked him just how long he thought it would take the Europeans to erect this United States of Europe — this FEDERAL Europe which he continually campaigns for — he said he thought it would take TEN YEARS to bring about political unification in Europe. Bible prophecy does not usually give exact dates, but it does indicate that it will not take that long. Once the move to unite Europe really gets rolling, it will not take long for it to crystallise. Who were the founding fathers of the Common Market? What were their aims — their main goals? "The founding fathers, such as Monnet, Schuman, Adenauer and De Gasperi, assumed that Economic unity would lead one day to a loose political integration" (Europe's Great Leap Forward, by John Cockcroft). "The central ultimate aim of the Brussels institutions is not to complete a prosperous, dynamic Common Market, important though that is. It is to use the Market system as the foundation for a European POLITICAL COMMUNITY to prevent war between European countries or between them and Russia" (Britain and the Common Market, published by The Daily Telegraph, art. "A Single European Foreign Policy," by Walter Farr). "For many of us a political strategic community is the dominant goal; the economic community of rather less vital interest except as the necessary road to a unity of a more general kind" (The Heartfelt Road to Europe, by Maurice Green). He then states: "The truth is that economic, POLITICAL and strategic unity are deeply interlinked and cannot be considered separately." The well-known British writer, Anthony Sampson, makes the following significant statement: "In the alarmed state of Europe at the time (shortly after the end of World War II), still more alarmed by the Korean War, the plan took shape quickly, embracing 'the Six' — France, Germany, Italy, Holland, Belgium and Luxembourg. The prime movers in the first three countries — Schuman, Adenauer, De Gasperi — were all men who had seen the two world wars, all passionate believers in reconciliation, all German speaking, all Catholics" (The New Europeans). He then tells why Britain refused to join "the Six." "The British were asked to join, but were too worried by the supranationalism and by Germany." What was the aim of these "prime movers" of the U.S.-of-Europe movement? This same author goes on to mention that: "The new Europe which did emerge was overwhelmingly Catholic and deeply marked by three leaders: Robert Schuman of France, Adenauer of the Federal Republic, and De Gasperi, the Prime Minister of Italy.... All were practicing Catholics with a deep sense of common purpose; all regarded the coal and steel pool as a first step towards full federal union. But none of them shared Monnet's desire to bring Britain in." Some have even questioned whether there is really much desire by some Continentals to bring liberal-thinking, Protestant England into this prosperous Catholic Common Market Community. Then Mr. Ellis mentions that all of the Six Common Market countries are Catholic — except one. "In the Common Market today only Holland of the six member states is predominantly Protestant." Actually, both Holland and West Germany are half Protestant and half Catholic. Some have wondered if one reason for the Six's reluctance to accept Great Britain might be that she is too liberal — too Protestant — and, if admitted into the EEC, might tend to go contrary to the wishes of the predominantly Catholic Common Market. Believe it or not, long ago, God Almighty revealed through the prophecies of the Bible that the coming United States of Europe would have strong religious connections. Here is a rather interesting quote, from a British news magazine, TOPIC (March 24, 1962). This article appeared during the time when Britain was still knocking on the Common Market door — before her first rejection by the Six. "The Vatican, usually cautious over political changes not of its own inspiration, now considers the Commoin Market the work of Divine Providence. Not since the times of Spain's Charles V has a Roman Catholic political force been so strongly welded. Not since the end of the Holy Roman Empire has the Holy See been offered a Catholic rallying point like the Common Market. If the 'Pact of Rome,' which created the Common Market, had been signed within the Vatican walls, it could not have favoured the Church more. There are 134,000,000 Catholics out of a total population of 175,000,000 in the original Six nations. The only Protestant bloc is in Western Germany, which remains a shaky 51 percent Protestant. But the 26,000,000 West German Catholics are not a silent minority, and can be compared to the Irish in America for aggressiveness, superb organization in politics, and calm optimism for the day when they become the majority. Meanwhile, they draw comfort knowing that 77 percent of the Six are Catholics." Not long ago, Herr Strauss mentioned that he thought Spain and Portugal would later stand a good chance being admitted into the Common Market. He said the political climate was not yet quite right for them to join the EEC. There is certainly good reason to believe that both Spain and Portugal will eventually become members of the Common Market. With their Catholic populations, they would increase considerably the percentage of Catholics in the Common Market. Some believe that staunch Catholics are less apt to turn toward Communism than more liberal-minded Protestants. How can one be a devout Catholic — believing strongly in God and yet become a Communist — an atheist? Certainly, whatever happens, Bible prophecy shows that the coming United States of Europe — referred to in King James' language as the "BEAST" of Revelation 13 and 17 — will have strong religious (or "Christian") connections. Sitting astride a United Europe will be a great Church or Church system — prophesied two thousand years ago (see Rev. 17). But, who is the "Beast" mentioned in the 13th and 17th chapters of Revelation? Many Bible commentaries point out that the "Beast" of the 13th and 17th chapters of Revelation is "the Roman Empire." It is also interesting that a Roman Catholic Bible (New Testament, Confraternity edition — published by the Catholic Book Publishing Company) has an interesting footnote comment on Rev. 17:11 as follows: "The beast spoken of here seems to be the Roman Empire, as in chapter 13." Let's speak plainly: the prophecies of your Bible reveal that in this end-time there would be the seventh and final revival (or resurrection) of the Roman Empire. The previous six revivals ("heads" in prophetic symbolism) were those led by Justinian, Charlemagne, Otto the Great, Charles the Great, Napoleon, Mussolini-Hitler — and the final seventh head is now in the process of being formed right before your very eyes! In the second chapter of Daniel, we find this same world kingdom depicted as the ten toes of the great image — representing the ten kings ultimately to unite at the very end of this age of man's 6,000-year period of misrule! Yes, the whole world will be utterly amazed when they see this "Beast" resurrected or revived — for the last time, thank God! What was the real significance of the Summit Meeting of the Six Common Market nations held at The Hague in December, 1969? The final communique issued by the Six revealed that the Common Market nations have pretty well completed the first step (economic integration) and are now about ready to enter the second and final stage for which the Common Market nations united in the first place — full POLITICAL union! "Never before have independent "Beast" — picturing the Roman Empire states pushed their cooperation further. ... The expiry of the transitional period at the end of the year has acquired major political significance. 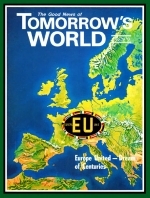 Entry upon the final stage of the Common Market not only means confirming the irreversible nature of the work accomplished by the communities, but also means paving the way for a UNITED EUROPE capable of assuming its responsibilities in the world of tomorrow and of making a contribution commensurate with its traditions and its mission" (The Times, London, Dec. 3, 1969). Yes, as we have been saying for nearly thirty years, a strong United States of Europe is in the making! Europeans are becoming impatient! Economic integration has pretty well been completed. Now, full political union is just around the corner! How will a U.S. of Europe affect America, Britain and the Commonwealth? Bible prophecy reveals that — unless our peoples return to God in real, heartrending repentance — God will permit a powerful United States of Europe to confront and destroy us, first economically, and then, as incredible as it sounds today, militarily. The outcome? If we don't turn from our waywardness — our adulteries, drug-taking, perversions, violence, murder and every evil imaginable — our nations will be humbled in the dust, wasted economically and incinerated militarily — all the work of the very Frankenstein monster which Marshall-Plan dollars created after World War II. Unless we repent as nations — or individually — these things are certain to come to pass in our lifetime! May God help us to be awake to today's fast moving world conditions — awake to what is happening, almost unnoticed, in Europe. If you don't already have a copy, be sure you write NOW requesting our free, fully illustrated, gripping book entitled United States and British Commonwealth in Prophecy — and keep pace with the real meaning of the news of today's world in the pages of TOMORROW'S WORLD!